If you are a blogger or online business owner, you have likely heard of Canva. I know most people use PicMonkey or Canva to make Pinterest images for their blog, among other things. I started with PicMonkey and then transferred over to Canva for awhile to see what all the fuss was about. While I still use PicMonkey on occasion, I am now a Canva girl at heart. However, even after using Canva, it took me awhile to make the update to Canva For Work. I figured I didn’t really need it, and I’m all about doing things for as low cost as possible. Then, I decided to take advantage of the free month of Canva For Work and kicked myself for not using it earlier. It is not just the addition of more images and fonts that makes it so awesome. One of the best things about Canva For Work is the ability to create your brand. You can click the “Your Brand” link on the left of your screen and have the ability to save things like your brand colors, fonts, and logos. This is another thing I didn’t do at first, but once I did, I was amazed at how much time it saved me when designing. Let’s explore it a bit more. This is where you can select your own brand colors and save them for future use. Canva even gives you help selecting color palettes if you need some inspiration. If you don’t have brand colors yet, search Pinterest and find some. You can use the hex codes to put in your exact brand colors. Canva lets you upload a bunch of colors, so take advantage. When uploading your brand colors, Canva will actually bring up some palettes they think you’ll like as well. Choose brand colors and colors you know you will use often. This is the place you can select the fonts you most commonly use for your brand. This is similar to selecting your brand colors. 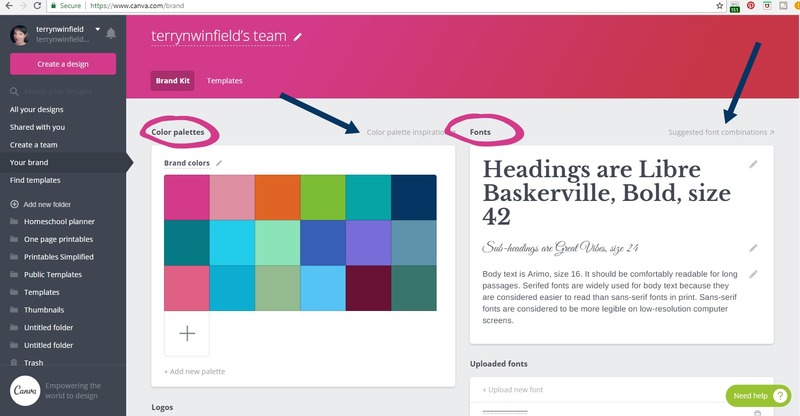 Canva gives you preset sizes for headings and subheadings and text. You don’t have to pay attention to that, just add the fonts that you want, in the particular sizes. I recommend only using 2-3 fonts in your branding. Most people choose some sort of script font and then a sans serif or serif font. Now take the time to upload your logo. If you have more than one business or more than one logo, upload them all! You can upload your logos, and your watermark, which makes it so easy to put your logo on your creations. You already chose your 2-3 fonts that you use in your branding. Now you can choose to upload fonts of your own! Canva lets you upload 25 additional fonts. Make sure you have the license or permission to use the fonts you upload before Canva ends up asking you anyway. I like to use this space to upload some fun fonts that I might use for an individual printable or for some pretty wall art, or something like that. It gives me more room for creativity. This is another feature in Canva For Work that will save you so much time. You are able to make and save templates in a special location. This is so helpful when you need to create a quick printable, because you have something you can just grab and tweak with a few clicks. You also have the option of creating a template for an Ebook or multi page product. The template tab is located right near Brand Kit. When you click on that, you’ll notice that Canva already has some pre formatted tempates you can use. You can also remove these if you don’t want them. You’ll notice a Public switch with a drop down menu. This is how you can publish your work as a template. You’ll then see your template in the Template tab of your brand section. You can also choose to publish your templates as public if you want to share them. It may be my Type A personality, but I love the option of now having folders to organize my work. 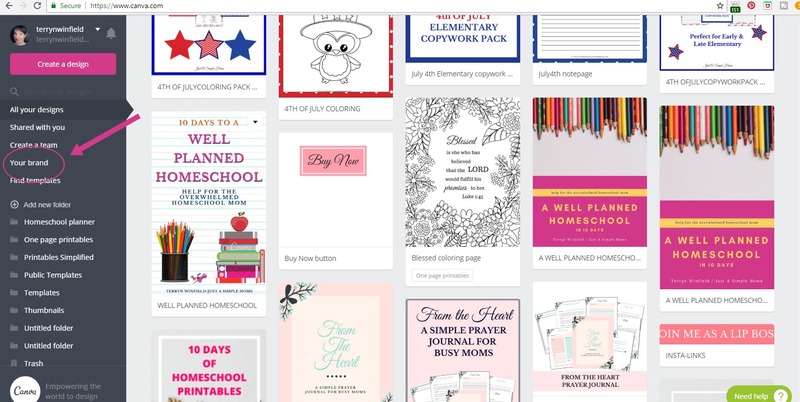 You can create folders for anything you want to keep organized, so you can easily find it later on. I have folders for different planners, stock photos, holidays, templates, printables and more. This saves me so much time when I know I have a specific image I want to use in a project. I don’t have to scroll forever through hundreds of images. Like I told you, it took me awhile to start using Canva For Work, and I wish I had started earlier. I might not have felt so scatterbrained! Hopefully, you aren’t going to waste as much time as I did. 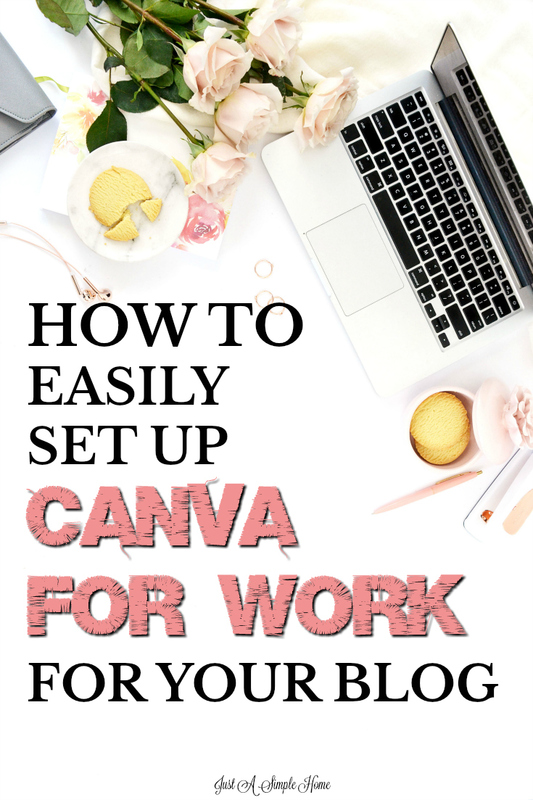 Setting up your Canva For Work account now will maximize your productivity and pay dividends in your business. You will know that you have a place where your brand colors, fonts, templates and more are at your fingertips. This information is extremely helpful and easy to follow. Love all the color fonts to choose from. While I have a Canva account, I’ve never really used it. It sounds like Canva for Work has a lot of great features that will save time and help me maintain a consistent look and save a lot of time! I have a Canva account and have used it. But I seem to only use it when I’ve finished a post. I need to dig in and discover all the ways it can help me. Thanks for the information. I LOVE Canva. Once I found out how to do all of these things, it made making graphics so much easier and uniformed. While I like for them to have their individual “personalities” and styles, what you mentioned still makes them cohesive. I had no idea these were even options! Thank you! I’ve been using picmonkey, but Canva looks so much better! Need to check it out. Thank you! I really can’t believe I didn’t know about this until recently. And I’m still learning so much, but it is amazing! wow what great information! I need to save this for later when I get a moment to look into Canva!